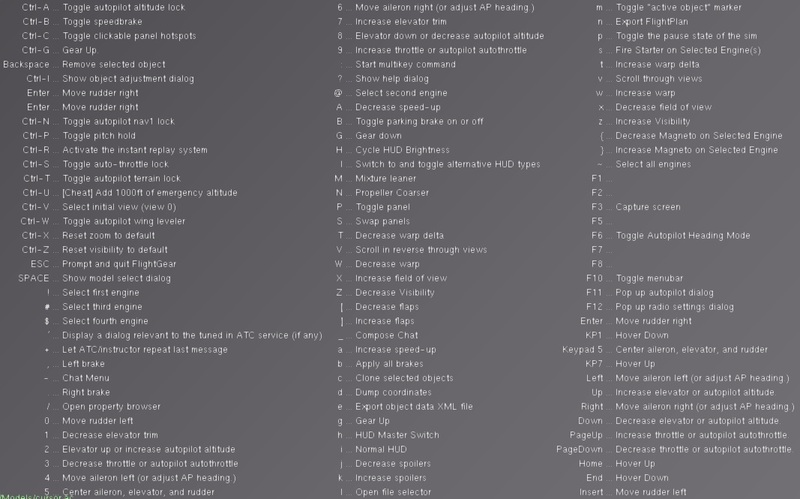 Maybe it would be possible to create a Nasal script that reads the key bindings currently used and displays it in a list like the "common aircraft keys" in the help menu. that would definitely be possible - you would just need to add some meta information to the tags - or just take what the tooltips use. jam007 wrote in Thu May 02, 2013 8:12 am: Maybe it would be possible to create a Nasal script that reads the key bindings currently used and displays it in a list like the "common aircraft keys" in the help menu. Press "?" to get what the author of an aircraft though was needed. I believe common aircraft key should be common (as in not specific) aircraft keys. Maybe there could be a key mapping dialogue. Well, taking into account that we need to be able to fly anything from a hangglider to a rocket - can anyone come up with a complete scheme how to assign keys rather than isolated ideas? Because that'd be the only thing that has a chance of being discussed and implemented. Johan G wrote in Thu May 02, 2013 8:41 pm: Maybe there could be a key mapping dialogue. Reading the property tree and displaying key and desc in a dialog would be a aircraft designer / current set up independent way to in-sim show all current keybindings for the user. Actually it probably easy to implement based on already existing Nasal-gui metods. I had first posted a rather boring "can't do" post, but thought a bit more after that. If the aircraft author have done a good job, in essence have been using <desc> tags and a good description, that will probably work, and even work well at that. Displaying all keys is easy, but hard to fit nicely in some logical groups; especially on smaller screens. Just displaying a giant list of keys isn't very nice IMO (see image). They'd have to be grouped like "flight controls", "autopilot", "simulator" etc. Basically what we do manually now with the various dialogs. EDIT2: Here's some ugly code that does the latter: http://pastebin.com/hnFQ3aEk Overwrite the contents of $FG_ROOT/Nasal/gui.nas with this (make a backup first!) and launch FlightGear with an aircraft that has some custom keys (eg. UFO, C172P, 747-400). Nasal experts, feel free to improve. You'll find the interesting stuff from line 1187 onwards. Just wondering how useful it is for the user to differentiate between default and custom keys. When flying your main question is witch key to push rather than is it default or custom. Would it be better to show all keys but mark the custom in some way? Is it possible to add a category tag in the keyboard .xml. And use that to list the keys under different headings/tabs? yes, you can add pretty much arbitrary tags or attributes to differentiate keybindings and introduce classes or categories. B.T.W. I am reworking the whole keyboard bindings now so that I can use the keys I am used to from other sims. and FG is like a new-born baby for me with the key-bindings I am used to !!! Created categories for keyboard.xml and made a function that could be added to giu.nas that shows all keys by category. It adds a (c) after keys changed from default based on Gijs code. Excellent! It may need some more styling though, I'll have a look at it when I'm at my FG computer. Yes. (I tried using tabs \t to get a better table but it did not work.) Gladly leaves this to someone who understands fg-dialogs. you can check the multiplayer pilot list/system monitor dialogs for examples on creating a simple table-driven layout.